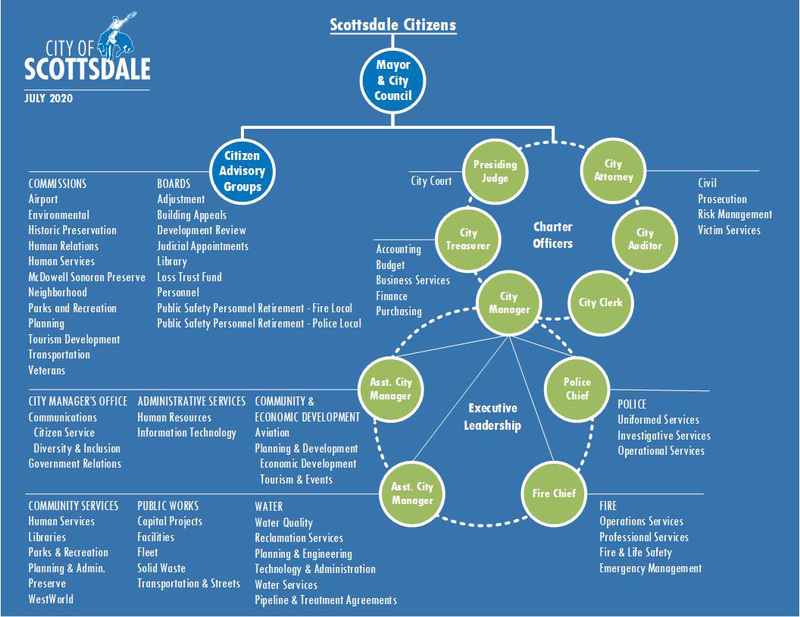 The Mayor and City Council establish the city's mission and goals, enact local legislation, adopt budgets and set policies to serve the needs of the citizens of Scottsdale. The City Attorney’s Office advises the city on legal matters, litigates civil claims and lawsuits, prosecutes misdemeanors, and provides legally mandated notification services and professional-level victim advocacy to misdemeanor crime victims. The City Auditor independently evaluates the operational efficiency, effectiveness, compliance and accountability of city personnel and operations. The City Clerk's Office prepares and distributes City Council meeting agendas and minutes, preserves the permanent records of the city, ensures that legal requirements for the publication of ordinances and resolutions are met, oversees city elections and coordinates the city’s boards, commissions, committees and task forces. The Scottsdale City Court is part of the integrated judicial system for Arizona, and is the judicial branch for the city. The court provides a dignified professional forum for the efficient resolution of cases including civil traffic and misdemeanor violations, petty offenses, city ordinance and code violations, and the issuance of protective orders. The City Manager is the city’s chief operating officer, responsible for the daily activities of most of the city’s departments. The City Treasurer is the city's chief financial officer, responsible for providing timely financial reports and analysis in addition to managing Scottsdale’s budget, finance, risk management and utility billing services. Scottsdale Airport is a general aviation facility that is home to many of the Valley’s private and corporate aircraft. Community Services provides world-class parks and recreation services and programs, libraries and human services and oversees Scottsdale’s McDowell Sonoran Preserve. Economic Development supports the business retention, expansion, attraction and entrepreneurial ecosystem and development that is critical to Scottsdale's economic health and sustainability. Scottsdale fire provides advance life support, emergency and community medical care, fights fires and response to all-hazardous events and incidents within a contemporary fire service delivery system that emphasizes prevention services and a robust community risk reduction strategy. The Human Resources (HR) Department supports over 2600 city employees. HR is responsible for the recruitment and selection process; conducts employee and management consultations and investigations; administers employee rules, policies, regulations, classification and compensation plans; provides employee benefits, wellness programs, training and workforce development; and coordinates the citywide volunteer program. Information Technology develops and manages the technology infrastructure and applications used to deliver services to the city’s residents and customers. 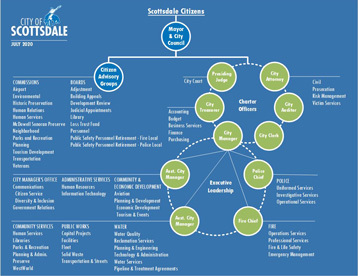 The Office of Communication develops and distributes information to help Scottsdale residents and customers learn about city services, programs, and projects. Mon, Tue, Thur, Fri: 8 - 5 p.m. Wed: 9 - 5 p.m.
Planning & Development works in partnership with the community to physically and aesthetically shape the city through long-range and current planning services, building plan review and inspections and code enforcement. The Scottsdale Police Department is an internationally accredited, full service agency committed to excellence, initiative and integrity. Public Works provides many of the city’s core services including trash and recycling, street maintenance, traffic management and construction management of city roads, buildings, parks and infrastructure. Purchasing is responsible for acquiring goods and services to support the city’s priorities and programs – most of this activity is conducted through public solicitations and bids. Tourism & Events coordinates support and expansion of tourism, events, arts, and culture in Scottsdale. Transportation plans and engineers the city’s street system and coordinates trolley, bus and other alternative transportation services. Scottsdale Water has been providing quality drinking water and advanced reclamation services to Scottsdale businesses and residents for over 40 years. With more than 300,000 square feet of exhibition space on 386 acres of flexible open area at the base of the breathtaking McDowell Mountains, WestWorld offers limitless possibilities for event producers and planners. Note: Holidays falling on Saturday will be observed on Friday and holidays falling on Sunday will be observed on Monday.